Sinead O’Connor demands that Miley Cyrus "take five minutes between G-string changes" to apologize to her, to Amanda Bynes, and to "every other sufferer of mental health problems." 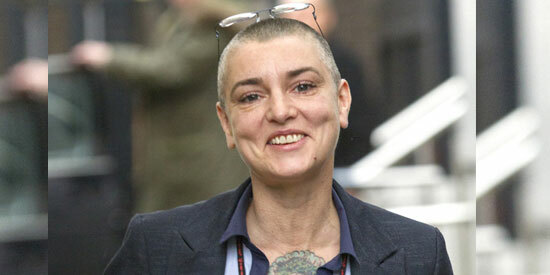 Sinead O’Connor has demanded that Miley Cyrus "take five minutes between G-string changes" to apologize to her. The Irish singer is continuing her feud with the "Wrecking Ball" singer, after Miley compared her to troubled teen star Amanda Bynes, who is currently being treated for mental health problems. In her third open letter to Miley, Sinead—who suffers from bipolar disorder—writes: "I have no interest whatsoever in meeting you. You had plenty of time yesterday to abuse Amanda Bynes... an entirely innocent party.. and myself.. who also did nothing to deserve your abuse.. along with every other sufferer of mental health problems and every person who suffered abuse at the hands of priests. "You can take five minutes today between g- string f***in’ changes to publicly apologise and remove your abusive tweets. If you do not then you don’t give a s**t who you mock and what damage you do by being so ignorant. "What you did yesterday was designed to damage me and my career ... since you deliberately gave the impression those tweets of mine were not two years old but reflect my current condition." Sinead then threatened legal action, and urged Miley to be a "proper woman." She added: "If you cannot apologise I will have no choice but to bring legal proceedings against you since it is extremely hard to be given work when people think one is suffering from mental illness. "When you end up in the psych ward or rehab I’ll be happy to visit you.. and would not lower myself to mock you. "Be a proper woman and make the public apologies I have listed above... How do you feel when your friend Britney Spears is mocked and humiliated for having had mental health problems? "I know I personally want to bash those who treat her that way... you ought to apologise for joining those who mock and humiliate women who have been too nice frankly, to manage the music business without sensibly losing their minds." Sinead, 46, also issued a warning that Miley could soon face her own battles with mental health if she doesn’t calm down. She wrote: "Cease behaving in an anti-female capacity. You will become the victim of it shortly. Soon it will be you the media [call] ’crazy’ .. and you will not enjoy it.. and you will appreciate people (like myself) standing up for you. Which I will be happy to do.. if you earn my respect today by apologising publicly."